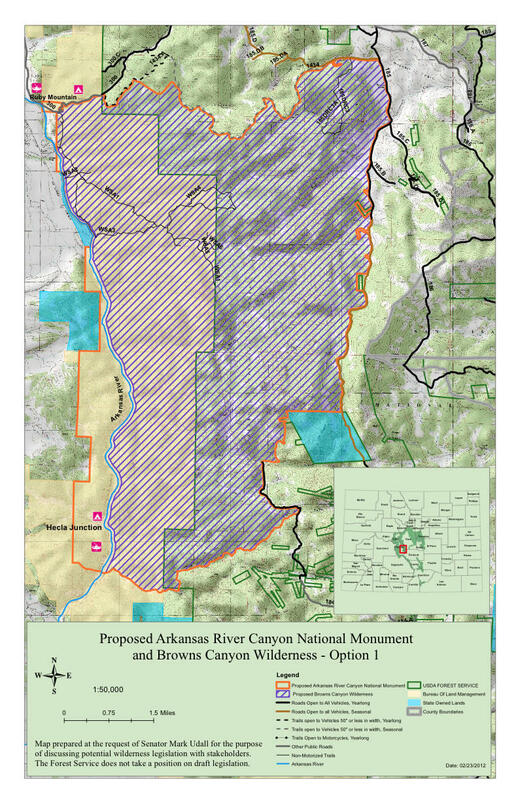 Proposed boundary for the national monument and wilderness area. Senator Mark Udall is expected in Chaffee County today to unveil new proposed legislation that looks to declare Browns Canyon a national monument and wilderness area. KRCC’s Maggie Spencer has more. The Arkansas River runs through Browns Canyon, and if passed, the bill would declare 22,000 acres of land from Nathrop to Salida a national monument and an additional 10,500 acres as protected wilderness. Mike Saccone, Senator Udall's spokesman, said the Democrat has been working on this for the past year and a half. "[the Senator has] been working side by side with Chaffee County leaders, residents, businesses and other stakeholders to develop legislation to create a Browns Canyon National Monument and Wilderness area. So, he’s developed this community-driven bill to ensure that future generations like him can enjoy Browns Canyon unique mix of whitewater and wilderness." Friends of Browns Canyon, a regional group that’s worked to protect the area, says such a move would preserve the land and recreation along the Arkansas for years to come.